A passenger assaulted a taxi driver by spraying him in the face with a fire extinguisher he had taken from the car boot. 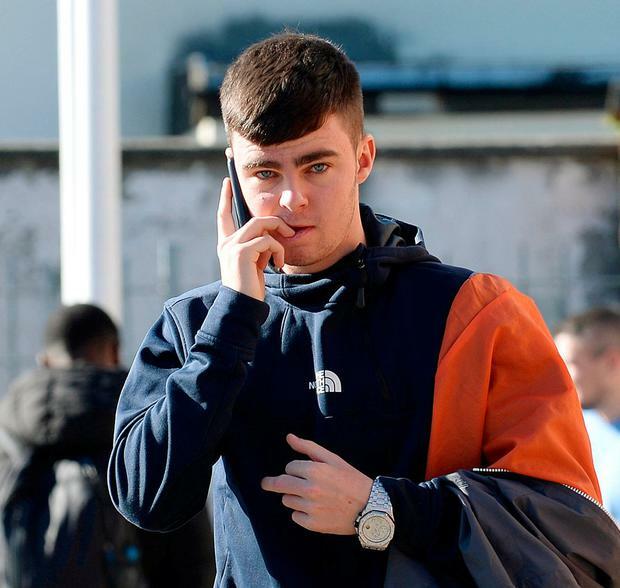 The assault by Cian Hand (20) left the taxi driver, who had recently had cataract surgery, with pain in his eyes. Judge Patricia McNamara ordered a pre-sentence report and adjourned sentencing to next February. The defendant, with an address at Killakee Lawns in Firhouse, admitted before Tallaght District Court to seriously assaulting a taxi driver and failing to pay a taxi fare on October 30, 2017. Sergeant Eithne Madden said the victim picked up four young men at St Stephen's Green around 7.15pm. The taxi driver dropped off one of the young men in Rathfarnham, before taking the other three men to the Templeroan estate in Knocklyon. When the driver reached Templeroan Green, Hand (below), who was sitting in the rear of the taxi behind the front passenger seat, reached into the boot and took out a fire extinguisher. Sgt Madden said Hand then discharged the fire extinguisher into the face of the taxi driver, causing him pain. The other two men got out of the vehicle and Hand continued to spray the taxi driver, before they all fled the scene. The unpaid fare was €27, the court heard. The defendant was identified from CCTV footage. Sergeant Kieran O'Neill said the taxi driver had cataract surgery shortly before the assault. He went to the Eye and Ear Hospital for treatment, before attending his local GP. He used eye drops in his eyes and had made a full recovery. The taxi driver was off work for two days and had to get the car cleaned and valeted. The court heard Hand had no previous convictions. Defence lawyer Stephen Montgomery said Hand had a problem with pills and cocaine when he was in his late teens. Hand later developed an autoimmune disease due to his cocaine use, and this left him in hospital. Hand was highly intoxicated at the time of this offence, Mr Montgomery said. The defendant had since turned his life around, was clean of drugs and was studying business and finance at Rathmines College. Judge McNamara said the offence was very serious and ordered a pre-sentence report. She also asked the Probation Service to investigate if Hand was suitable to complete community service.